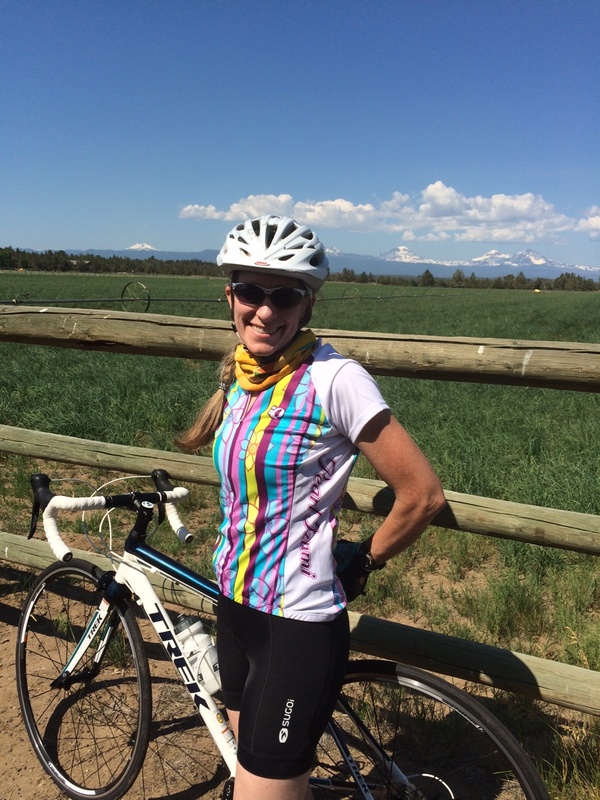 Survivor Highlight: Susan Strible, Tour des Chutes Board Member. How did you first become involved in TdC? In July 2014, I did the 50-mile ride with my family and it was so magical. I loved being a part of it and it had a lasting impact on me. The community feel, the supportive atmosphere, and the way the cancer survivors were honored, all sparked something deep inside of me. Even though cancer was not something I was intimately acquainted with at the time, I felt a strong connection to this event and the people involved. A couple of months later, a friend invited me on a group run in Shevlin Park. On that run I met Leslie Cogswell, the Executive Director of TdC. We chatted about her work with TdC and my background in Marketing. I was so enamored of the event, and Leslie’s engaging personality, I told Leslie that if she ever needed any Marketing help to please keep me in mind. Not long after, Leslie invited me to join the Tour des Chutes Board. Thrilled to be included as part of this team, I never looked back. I rode the 50-mile route again in July 2015, this time as a board member. What has the event meant to you in the past? In the past, the event meant the support of three things that are important to me: 1) Community. This event brings together several hundred of our friends, neighbors and family members to share love and support for each other, 2) Fitness. From walking three miles to riding 100 miles, this event celebrates movement and physical fitness, and 3) Cancer Survivor Support. This event directly supports and honors Cancer Survivors in Central Oregon and celebrates their ongoing fight. These three things are still the cornerstones of why I love this event. Of course, my perspective and commitment has deepened through my own recent experience with cancer. How has that changed now that you are yourself a survivor? Ironically, the day I was diagnosed with Stage II breast cancer in early October 2015, that evening we had a Tour des Chutes Board Meeting scheduled. It didn’t occur to me to skip the meeting. I thought, what better place for me to be than surrounded by these supportive board members, many of whom have battled cancer themselves? That meeting and the support I received that evening helped set the stage for how I was going to face this terrible diagnosis. Now, as a cancer patient, I’m on the inside and I’ve seen first-hand how this event, and the money raised, benefits Cancer Survivors in Central Oregon. I’ve been able to receive the healing touch of Reiki therapy, massage from a therapist trained to treat chemo patients, I’ve listened to an inspirational talk given by an ovarian cancer survivor, and received nutritional advice from the Cancer Center’s Dietician – all at no additional cost. These programs exist, in part, because of the money raised by Tour des Chutes. Tour des Chutes has changed for me in that I see it as so much more than a fun bike ride or 5K run/walk. It serves a critical need in our community and it’s part of what makes Central Oregon a wonderful place to live. Would you mind sharing a bit about your journey through being diagnosed with cancer and how that has affected your perspective? No one expects to be told they have cancer. It’s a terrible shock. Since that day, I’ve managed to keep my focus on getting through chemotherapy (I just passed the halfway point), surgery, and radiation, and then getting on with my life. I haven’t spent much time dwelling on whether my life will be shortened by this disease. Whether it will be shortened or not, thinking about it will not change what is to come (easier said than done – I’ve shed many tears around these thoughts). Also, I’ve found that reading about my type of cancer, triple-negative invasive ductal carcinoma, and about others’ experiences with cancer does not improve my state of mind. I find that my experience is what matters, and so far, I’ve been able to create my own reality, without any expectations put on me by outside information. My mind is more able to stay positive by focusing on my family, my friends, and my work. I do not want cancer to define who I am. Any final thoughts on survivorship? Every day, I’m blown away by the support from my family, friends and coworkers. The one silver lining in all of this is the amount of love that has utterly surrounded me. In a very strange way, cancer equals love. The power of love and human caring is one of the strongest tools in our cancer-fighting arsenal. It’s surely the one that feels the best. I’ll be forever grateful to all of those, near and far, who have made me feel loved and supported. It has made all the difference to me. I’ve been able to deepen relationships with my friends who’ve dealt with, or are still dealing with cancer. They have inspired me to be strong and fight, while recognizing my desire to keep my real life sharply in focus. On survivorship, whenever I hear this word, I think of Gary Bonacker, the founder and inspiration behind Tour des Chutes. A constant source of encouragement, he said, ‘I don’t just want to be a survivor, I want to be a thriver.’ My goal is to ride the 50 miler again in 2016, this time as a thriver. Whether you walk, run, ride or volunteer, I hope to see you out there on July 9, 2016.